This vegetarian lasagna recipe comes from the rolling hills of Tuscany. 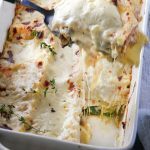 Creamy béchamel sauce, smoky mozzarella cheese and fresh summer zucchini are a stellar trio, lasagna with white sauce, at its best. I could give you a recap of our family vacation to Italy based on the food we ate in each city, each town, each square. It was all so incredibly delicious and memorable…but don’t worry, I won’t. At least not all in one post. 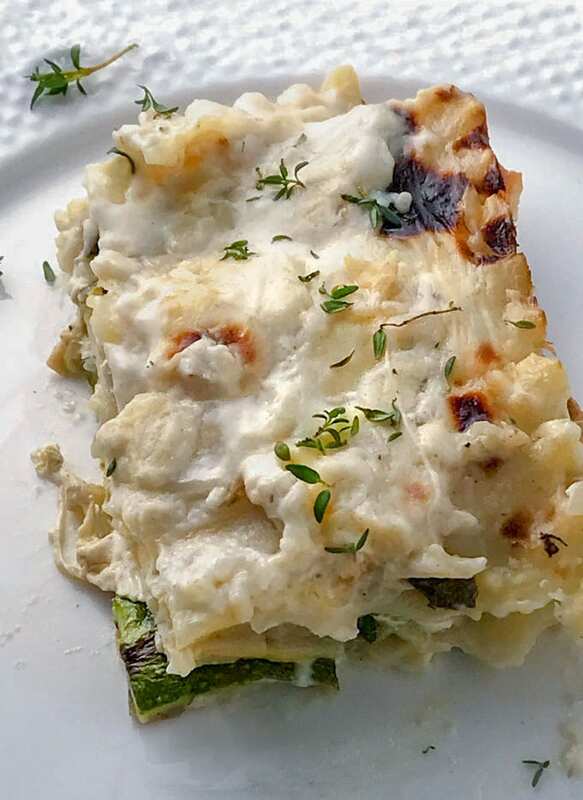 I’ll just start with the mouthwatering vegetarian lasagna we enjoyed in the hilltop town of Radicondoli, at a wonderful restaurant called Agriteca In Piazza. Everything was delicious at that restaurant but the smoky, creamy, tender vegetarian lasagna was the star dish of the evening. 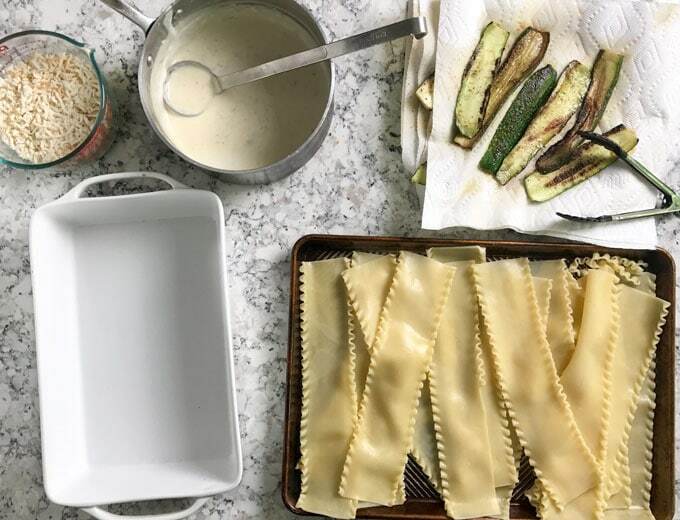 I got as much info as I could get out of the waiter: cooked lasagna noodles, fresh zucchini, smoked mozzarella shipped in from a local farm, béchamel sauce infused with extra smokiness by adding some of the smoky liquid that the mozzarella sits in. That the info I used (plus lots of recipe testing) to recreate that incredible dish. The recipe is as easy as lasagna can be. Cook the noodles. Shred the cheese. Sauté the zucchini. Make the sauce…. Layer it all up and bake it. A few words about this béchamel sauce. You probably think of béchamel as a French sauce, but balsamella (as it is called in Italian) is used in many Italian dishes, especially lasagnas. One essential difference between the French and Italian béchamel sauces is that the French roux (flour and butter mixture) is browned and the Italian roux is not. My spin on this Italian béchamel is to add a good amount of shallots, garlic and parmesan cheese to the mix. You will not believe how creamy and delicious it is, especially when it’s hot and mixed with noodles and melted smoked mozzarella…. This is vegetarian lasagna that will make carnivores happy too. As a whole, the food in Tuscany is spectacular. The recipes are simple and rustic and made from exceptionally high quality local produce, incredible artisan cheeses and meats. And of course all meals are accompanied with delicious local wine, flowing generously. “Use the best ingredients and exalt them.” That’s the advice I once got from a well-know Italian chef. I think about that line often and especially as we munched our way through Tuscany. I’m excited to recreate more of our favorite recipes from the trip. 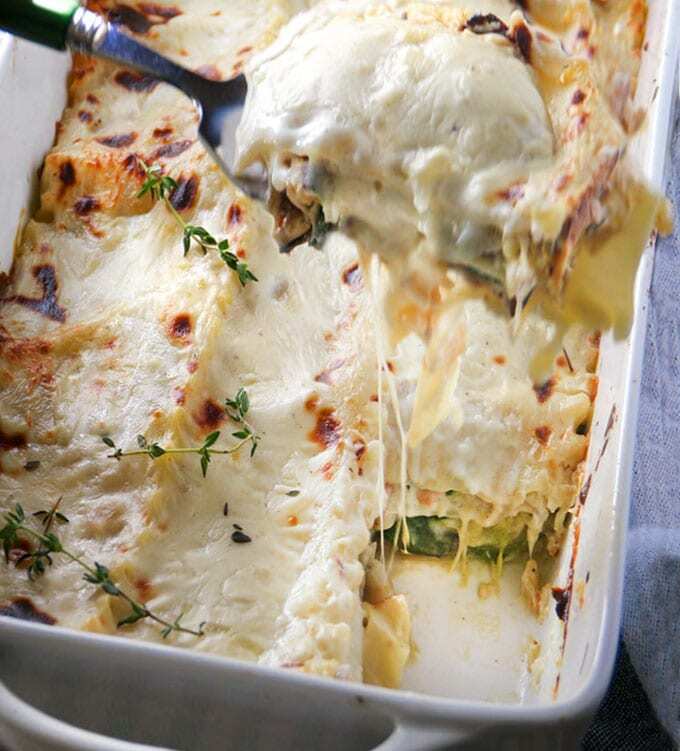 For now, here’s the recipe for Tuscan Vegetarian Lasagna. I hope you try it! And if you do, please come back to leave a review and let me know how you like it. 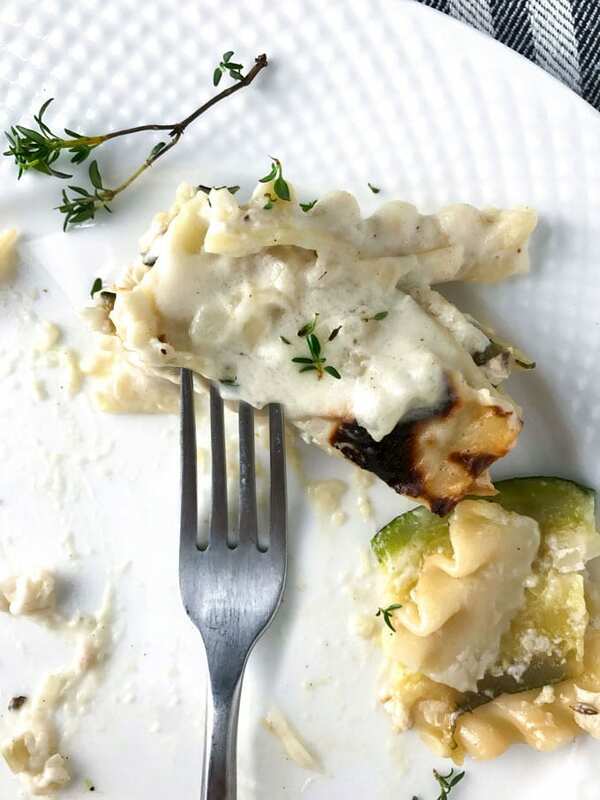 A vegetarian lasagna with creamy white sauce and smoked mozzarella. Family friendly, company worthy, so good! Cook The Noodles: Bring a large pot of salted water to a boil with 1 tablespoon of salt. Cook the lasagna noodles, following package directions. Drain and lay them out on a tray or baking pan to cool, so they don’t stick together. Make the Béchamel Sauce: You’ll need two saucepans. Combine milk and water in one saucepan. Heat until it just starts to steam. Remove from heat. Heat butter in another saucepan, over medium heat until melted. Add shallots and cook for 2 minutes, to soften them. Add the flour and stir constantly for one minute with a wooden spoon. Don’t let the mixture brown. Slowly pour in some hot milk while whisking constantly. The mixture will get thick. Slowly add the rest of the hot milk, whisking constantly. The mixture will get thinner. When all the milk is added, squeeze in the garlic with a garlic press, and season the mixture with 1 teaspoon of salt, 1/4 teaspoon of white pepper and a pinch or two of nutmeg. Add the parmesan cheese while whisking constantly. Continue whisking frequently, over medium heat, for 10-15 minutes, until the sauce thickens to the point where it coats the whisk thickly. Remove from the heat. Sauté The Zucchini: Line a plate with a double layer of paper towels and have more paper towels handy. Heat 2 tablespoons of olive oil in a large heavy skillet over medium-high heat. Add 6 zucchini slices to the pan or as many as will fit in a single layer. (you’ll need to cook the zucchini in batches) Sauté zucchini for about 2 minutes per side, until lightly browned in spots. Transfer to prepared plate. Sprinkle with a pinch of salt and a few grinds of black pepper. Repeat in batches, until all the zucchini is browned, adding a sheet of paper towel between batches. 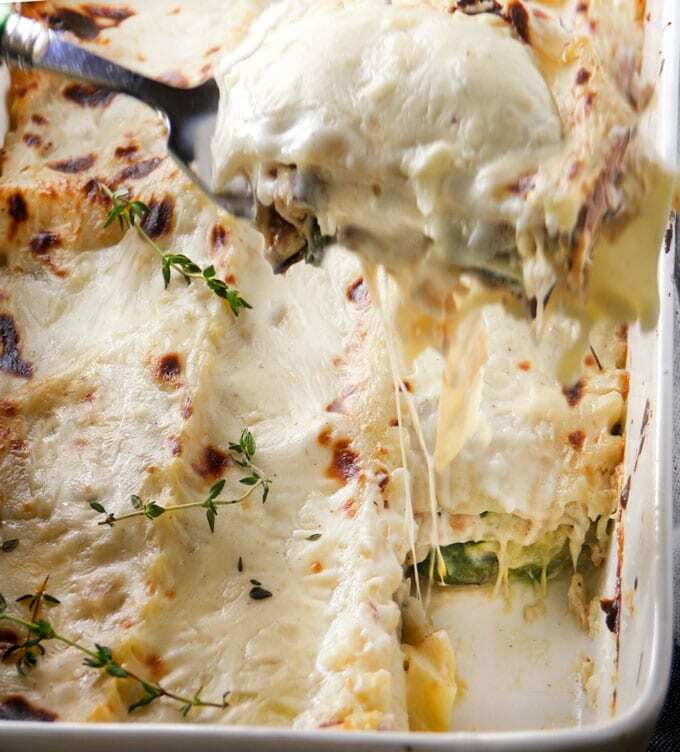 Assemble The Lasagna: Spread about 2/3 cup of bechamel sauce over the bottom of an 8 x 12 x 2 inch casserole. Top with three lasagna noodles. Arrange half of the zucchini over the noodles. Top evenly with half of the mozzarella, then a third of the sauce. Repeat with a layer of three noodles, the rest of the zucchini, the rest of the mozzarella, half the of the remaining sauce. Top with a final layer of noodles and the rest of the sauce. Bake The Lasagna, uncovered, in the center of the oven for 45 minutes. If you want the top to brown, turn the oven up to broil for the last 3-5 minutes, watching carefully to prevent the top from burning. Remove from the oven and let the lasagna rest for 15 minutes. Sprinkle with fresh thyme leaves and decorate with thyme sprigs, if you like. Serve warm. Our vegetarian friend was coming for dinner, and my husband said I definitely could not give him plain old veggie burgers for dinner. I looked on the computer for something different, and came upon your recipe. WOW! I couldn’t find smoked mozzarella, but our local shop had smoked gouda. I used about a pound and a quarter (which they sliced, making it very easy), and this has to be one of the best meals I have ever made. Thank you so much for this yummy recipe. I shall be making it again, and again, and again!!! Always love a fresh take on lasagna! YUMMY!!! Thank you, Lisa!! !